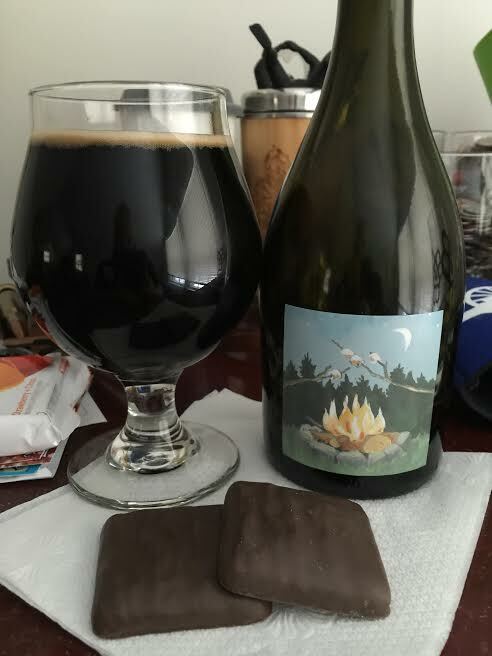 "An Imperial Stout made with roasted marshmallows and graham crackers. Chocolate, cotton candy, and vanilla aromatics with flavors of charred marshmallow and dark chocolate. A collaboration between Barreled Souls and Slab Sicilian Streetfood. Finished for ten months in Woodford Reserve Barrels." Pours as black as you can get with a finger of brown head. It can get none more black. Those marshmallows are intense and they fill the room with its melted aroma. It seriously smells like a fresh container of marshmallow Fluff. Graham cracker crust and a big chocolate influence from the stout base make for a mouth-watering dessert aroma. I get some oak and wood from the barrel, but the bourbon itself is incredibly faint. However, the base beer is so decadent, I don't seem to care. The taste unfortunately has a good amount of alcohol to it, but it's not enough to stop you from completely enjoying the experience. The bourbon itself is bigger on the taste with a big kick of sweetness. Other barrel characters such as oak, wood, and char are subtle, but they are all present and accounted for. Some nice dark chocolate notes continue the dessert theme, but the marshmallow intensity from the aroma doesn't translate over to the taste too well. Those graham crackers are also lacking and the taste is really just the alcohol and sweet bourbon. The back end has some sort of sticky molasses taste which is more reminiscent of English Old Ales especially with those small oak barrel flavors. Mouthfeel is a little lighter than I want from my BA Stouts, but it is still thick enough to get the job done (not the first time I've said that...rimshot). It has a good amount of carbonation to it which prevents the body from being silky smooth. The alcohol presence stops it from being a truly drinkable dessert beer, but again, it's not so bad that it ruins the fun. BA Stay Puft had a promising aroma reminiscent of a melted s'more roasting over a roaring campfire, but the taste didn't produce the same experience. I have a feeling the base beer, sans the barrel-aging, is a mind-blowing experience and I think the addition of the alcohol-soaked bourbon all but eliminated the marshmallow and graham crackers. The taste is more like a standard BA stout, but with more pure alcohol taste. I could smell this beer all day long, but the taste and feel leave something to be desired.